CAD Systems in Mechanical and Production Engineering explains the many components that make up the CAD function and how these fit and interact with other elements of the computer integrated system, especially in relation to production. The book reviews the role that computers play in engineering and production design including integration of computer systems and the incorporation of artificial intelligence in the user interface. The computer unit includes the mouse, keyboard, displays, and the whole unit uses the American Standard Code for Information Interchange (ASCII) which represents typewriter characters by a pattern of bits. The book also describes the Raster-Scan displays, plasma panels, LCDs, LEDs, and 3Ds. CAD system uses calligraphic type or raster type plotters, pen plotters, character printers for hard copies or for crude pixelated copies. 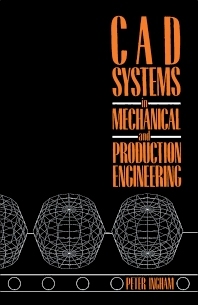 The book describes the organization of CAD processors and the use of networking. The text also explains the many kinds of software and the elements of computer graphics such as rotation, two-dimensional transformations, and image realism. Management issues that can arise during the transition from a manual to a computerized system include personnel adaptation rates and appointment of CAD personnel. The text also provides some CAD standards used in Manufacturing Automation Protocol or in Technical Office Protocol. The book is suitable for computer programmers, engineers, designers of industrial processes, and researchers involved in electrical, computer, or mechanical engineering. What is Required of a Management Information System?